Cook and stir sausage and onions in extra virgin coconut oil in heavy oven-proof 10-inch skillet on medium heat 5 minutes or until light golden brown. Combine remaining ingredients in medium bowl. Stir egg mixture into skillet mixture. Cook on medium heat, lifting with a rubber spatula once or twice, to allow uncooked portion to flow underneath. Cook just until egg mixture begins to set, about 6 minutes. Place skillet in oven. Bake 5 to 7 minutes or until egg mixture is firm to the touch and top is golden brown. Remove skillet from oven. Carefully run a spatula around edge of frittata to loosen from skillet. Invert skillet onto serving platter. 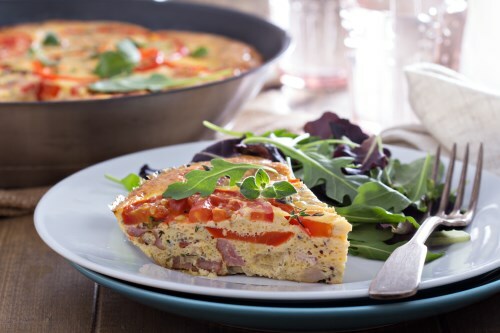 Cut frittata into quarters. Garnish each portion with Parmesan cheese and basil, if desired.